The other night sleep was interrupted with the sounds of ducks quacking. It was a fox, and it got our drake. Yesterday morning, during the pen move, there was a fox sighting, and tracking. They are small, quick and usually elusive...but this one was watched as it left. Fence walks will take place and gaps will be repaired. Holes tunneled under the fence will be filled with rocks. 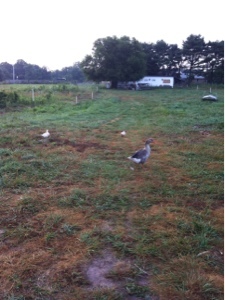 And we will need to locate some ducklings, as ducks are a great thing to have on the farm. Mosquito control and general comical demeanor. We have duck eggs in the incubator, but it is getting to be too long a time for them to be in there, if they were going to hatch they probably would have done so by now. Time to check Craigslist.